EDITOR’S NOTE: The launch of Zuma has been delayed to Friday, Nov. 17. A top secret payload developed in secrecy for the U.S. government is set to ride into orbit from Florida’s Space Coast aboard a SpaceX Falcon 9 rocket Thursday. Known only by the codename Zuma, the payload is likely heading for an orbit less than 1,000 miles in altitude, and perhaps much lower. The existence of the mission was not revealed until it was disclosed in regulatory filings last month. A disclosure so close to launch is rare in the space industry, and little information about the mission has been released in the last few weeks. Clandestine spacecraft owned by the National Reconnaissance Office — the U.S. government’s spy satellite agency — receive codenames years before they lift off. They’re also listed in public procurement documents and launch manifests. Northrop Grumman acknowledged its role in the Zuma mission in a statement, confirming it arranged for the launch with SpaceX on the government’s behalf. “Northrop Grumman is proud to be a part of the Zuma launch,” said Lon Rains, communications director for Northrop Grumman’s space division. “This event represents a cost effective approach to space access for government missions. Northrop Grumman did not say whether it built the Zuma payload, but the defense contractor said it considered cost and risk in its selection of the Falcon 9. “As a company, Northrop Grumman realizes that this is monumental responsibility and have taken great care to ensure the most affordable and lowest risk scenario for Zuma,” the statement said. Officials have not divulged which U.S. government agency will be the primary user of the payload, or whether it’s a military or civilian group. Zuma could be a surveillance mission, a spy satellite, an experimental tech demo, or something else. The Falcon 9 rocket has a two-hour launch window to take off Thursday from the Kennedy Space Center in Florida. The opportunity opens at 8 p.m. EST (0100 GMT Friday). It will be the 45th launch of a Falcon 9 rocket, and the 17th Falcon 9 flight of the year, a record in the commercial launch business. Ground crews raised the 229-foot-tall (70-meter) Falcon 9 rocket vertical at launch pad 39A early Wednesday. The mission was supposed to blast off Wednesday night, but SpaceX announced a 24-hour launch delay to allow engineers to complete additional mission assurance work. 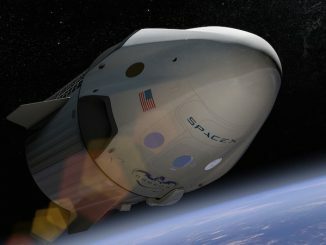 The SpaceX launch team will switch on the Falcon 9’s computers and verify their readiness for launch Thursday afternoon, and the countdown’s automatic sequencer will commence at T-minus 70 minutes, followed by the loading of super-chilled, densified rocket-grade RP-1 kerosene into the two-stage rocket. 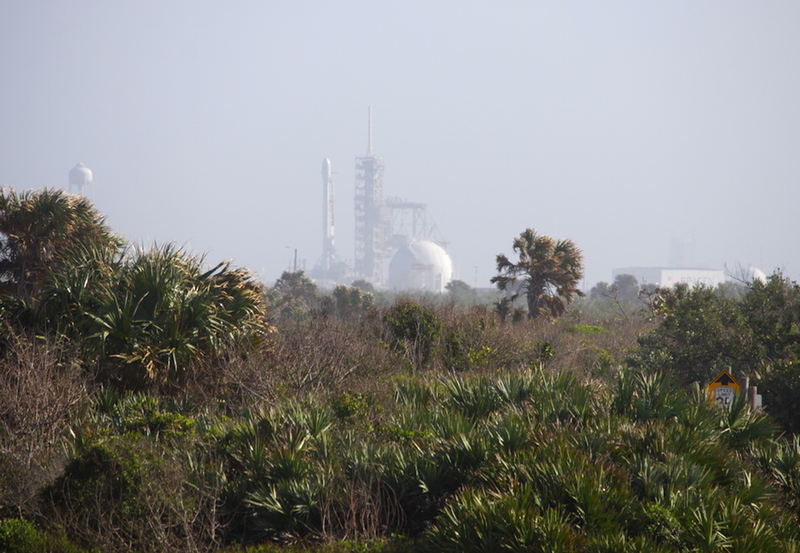 Cryogenic liquid oxygen will be pumped into the rocket beginning at T-minus 45 minutes. In the final 10 minutes of the countdown, the Falcon 9’s Merlin main engines will be readied for ignition and the rocket will be switched to internal power. The on-board computer will send the command to ignite the first stage’s nine Merlin 1D engines at T-minus 3 seconds. After throttling up to full power, the engines will power the Falcon 9 off the launch pad with 1.7 million pounds of thrust. Thursday’s flight will place the Zuma payload into low Earth orbit, according to Northrop Grumman, but the parameters of the target orbit have not been released. Most satellites in low Earth orbit fly less than 1,000 miles above the planet. A notice warning pilots to steer clear of the Falcon 9’s flight path suggest the rocket will head northeast from the Kennedy Space Center. Another advisory indicates the Falcon 9’s second stage will drop out of orbit after deploying the Zuma payload, heading for a re-entry over the southern Indian Ocean, where debris could fall into the sea southeast of Madagascar. Ted Molczan, a respected satellite watcher in Canada, analyzed the aviation advisories and predicts the Zuma payload will launch into an orbit with a tilt of approximately 50 degrees to the equator, but there is some uncertainty in the estimate. A coordinated network of amateur satellite observers communicating in an online forum will attempt to locate the Zuma payload after its launch, and an estimate of its expected orbit will help tell the trackers where to look. The U.S. military publishes information on the orbits of most satellites to avoid spacecraft collisions, but it withholds data on the government’s most secretive missions. “There are many possible orbits, so we can only try to be aware of what could happen, and plan the search accordingly,” Molczan told Spaceflight Now. One theory proposed by Marco Langbroek, an experienced tracker of satellite movements who lives in the Netherlands, suggests the Zuma payload could be related to a classified National Reconnaissance Office satellite launched on a Falcon 9 rocket in May. The secretive NRO spacecraft, designated USA-276, flies in an orbit inclined 50 degrees to the equator, similar or identical to the track Zuma is expected to take. What’s more, the USA-276 satellite will fly over Central Florida around 8:08 p.m. EST Thursday (0108 GMT Friday), eight minutes after the opening of the Falcon 9’s launch window. A launch in the first part of Thursday’s launch window would place Zuma very close to USA-276. USA-276 was the subject of its own pre-launch speculation because it did not go into an orbit used by any other NRO missions. It was also the first Falcon 9 launch dedicated to the U.S. government’s intelligence community. Ground-based observers using the SeeSat-L forum spotted the USA-276 satellite around three weeks after its May 1 launch from the Kennedy Space Center. They calculated it was in an orbit about 250 miles (400 kilometers) above Earth that oscillates between 50 degrees north and south latitude on each lap around the planet. 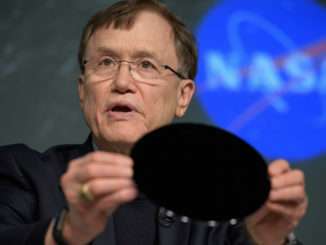 An NRO spokesperson said the USA-276 satellite was built by Ball Aerospace and Technologies Corp., but officials declined to describe its purpose. USA-276 made a mysterious flyby as close as 4 miles (6 kilometers) International Space Station in early June — a month after its launch — but Langbroek and Molczan are not sure whether the unusually close encounter was intentional. Ball Aerospace specializes in building small and medium-sized satellites. Most of Ball’s spacecraft have weighed less than 6,000 pounds (about 2,700 kilograms) at launch, and that is likely an upper bound on USA-276’s mass. 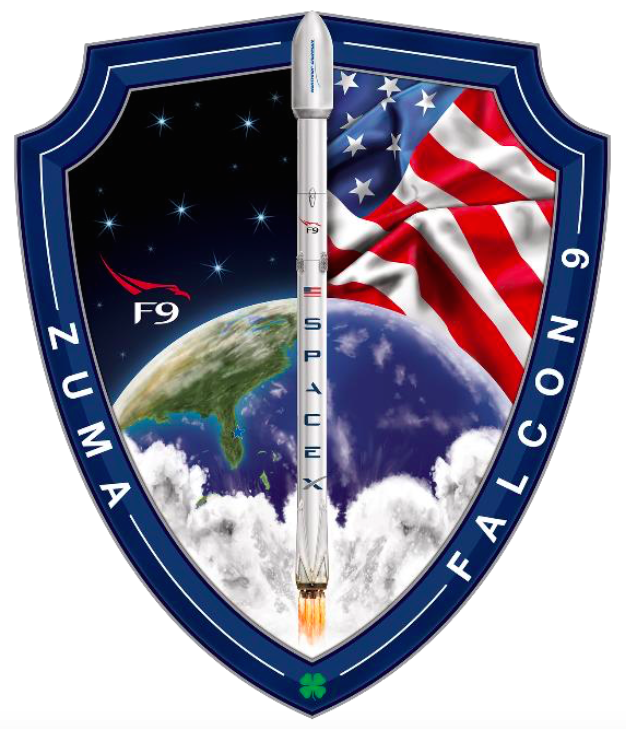 The Zuma payload flying on Thursday’s Falcon 9 launch is also believed to be relatively light. The Falcon 9’s first stage will fire its main engines for around 2 minutes, 16 seconds, on Thursday’s flight, then give way to the upper stage’s single engine to continue the climb into orbit. That is the shortest first stage firing on any Falcon 9 launch to date, one second shy of the booster’s burn time during the launch of USA-276 in May. SpaceX engineers can adjust the length of the first stage burn based on each mission’s requirements. A longer burn customarily means the satellite is heavier and going into a higher orbit — leaving less propellant in the tanks for landing maneuvers — and a shorter firing could mean the launch profile is not as demanding, suggesting a lighter payload and a lower orbit. The booster will attempt to return to land at Cape Canaveral Air Force Station, a controlled descent that can only be accomplished on missions heading for low orbits because it requires ample leftover fuel. A subset of the first stage’s nine Merlin engines will fire two times to guide the booster back toward land once it detaches from the Falcon 9 second stage high above the Atlantic Ocean. The first stage’s center engine will ignite again just before touchdown, and four landing legs will open at the base of the rocket as descends to Landing Zone 1 at Cape Canaveral. Landing is scheduled less than eight minutes after liftoff, according to a timeline provided by SpaceX. The company’s launch webcast is expected to end coverage of the second stage’s engine burn shortly after it ignites, complying with the wishes of Zuma’s owner. Live video will focus on the first stage’s descent back to Earth. 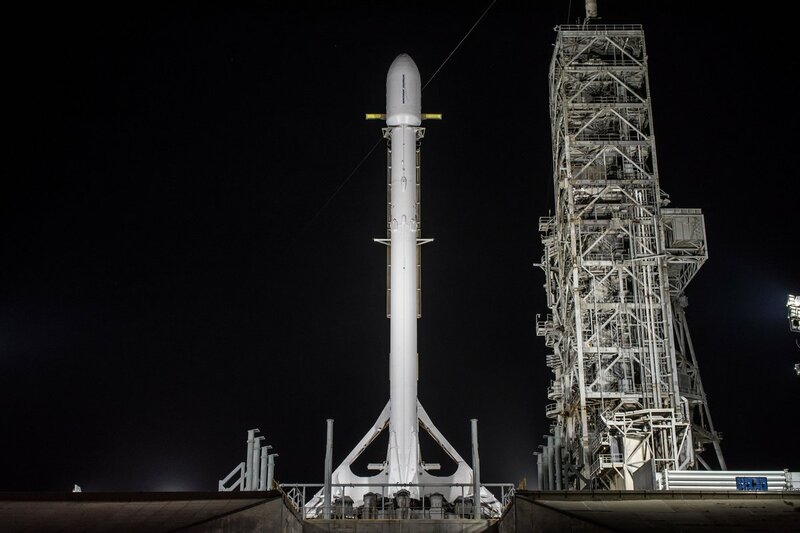 SpaceX will try to land a rocket at Landing Zone 1 for the eighth time on Thursday’s flight. Falcon 9 boosters have landed intact there or on offshore vessels 19 times, advancing SpaceX’s efforts to recover and reuse rockets. Three Falcon 9 missions have used previously-flown boosters to date. 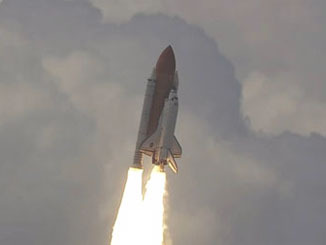 The first stage slated to get Zuma off the ground Thursday is set to fly for the first time.